A crash that brought a deafening ring over the city. A sight that brought millions to a standstill. An attack that sent shockwaves rippling through our nation. We all remember the headlines, the never ending news reels, the images and videos playing over and over again while all watched in astonishment. But with tragedy comes bravery and action. Without hesitation, TSSi partnered with vendors to form Operation Respond in an effort to aid the Law Enforcement and First Responders in New York City and Washington, D.C. Operation Respond gained phenomenal support from over 30 companies who donated supplies such as rescue tools, specialized clothing, and safety equipment. Several individuals donated their time to assist in the effort to pack, load, and ship all of this donated equipment. Between September 20 and October 10, 2001, over 17,000 pounds of equipment was shipped to the New York City Police Department’s Emergency Services Unit. 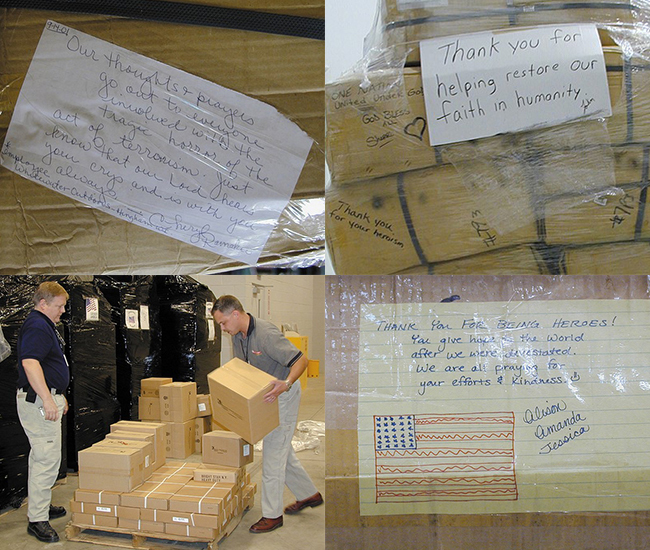 Not only did numerous vendors donate supplies to Operation Respond without hesitation, but letters and notes of encouragement were left on the pallets addressed to emergency services; a glimmer of hope for humanity flickering though the dark clouds of disaster, slow to dissipate at these tragic sites of terrorism. A small team of employees including TSSi’s CEO, Bill Strang, traveled to Ground Zero in New York City. They experienced firsthand the damage and despair left in the surge of the 9/11 attacks. Burned cars with windows blown out. Buildings barely standing on their foundations, just black sketches in the sky. Ashes and debris covering the ground and a grim fog blanketing the city. Because of the participation and support from our generous vendors, Operation Respond experienced great success with the assistance and donation of supplies to NYC and DC emergency responders. Our Congressman, Bob Goodlatte, as well as NYC Police Dept.’s Emergency Services Unit wrote to express their appreciation for everyone’s dedication and charity. 17 years later, TSSi still supports active missions and disaster relief throughout the world. We’re committed to helping law enforcement and emergency crews by providing both the best products for the job as well as outstanding response to fulfilling those needs.